Identical to bills introduced in previous sessions of Congress since 2013, the SAFE Act would outlaw the export of horses for slaughter on the basis that horse meat is a health hazard, based on the medications horses receive. Introduced in the 116th Congress by Representatives Jan Schakowsky (D-IL) and Vern Buchanan (R-FL), the Safeguard American Food Exports Act would outlaw the export of horses for slaughter in foreign countries as a prevention of a human health threat. The language of the bill states that equines, raised in the United States largely for recreational use, are regularly treated with medications not approved for use in animals intended for human consumption, and that the meat of such animals is therefore unsafe and poses a threat to human health. While the language of the bill may overlook the emotional argument against horse slaughter — namely, that these animals, while considered livestock, are thought of largely as pets and slaughter is an inhumane end that causes psychological and physical torment to horses — it focuses on scientifically-proven facts that are hard to deny. As a result, the bill is on stronger defendable ground than other lines of reasoning that focus more on the emotional reaction. It’s a drier, more clinical look at a complicated issue. November 10, 2005: The Agriculture, Rural Development, Food and Drug Administration, and Related Agencies Appropriations Act was signed into law, including a passage that outlawed federal funding for USDA horse meat inspectors. 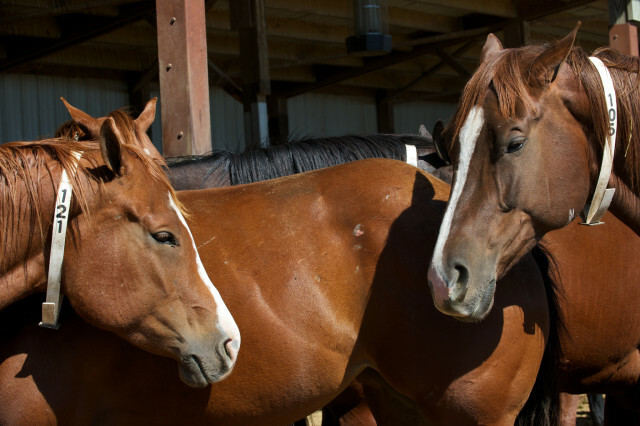 This law forced the equine slaughterhouses of the United States to shut down. February 8, 2006: The USDA allows slaughterhouses to pay their own inspectors, loopholing the previously-passed federal act. September 7, 2006: The American Horse Slaughter Prevention Act passes the House but the Senate bill dies in committee. January 2007: The American Horse Slaughter Prevention Act is reintroduced but never moves to a full vote in either the House or the Senate. March 28, 2007: A US District Court ruling closed the USDA loophole. However, the last remaining slaughterhouse in the US in DeKalb, Illinois appealed the decision and was able to resume operations. May 24, 2007: An Illinois bill was signed into law to outlaw slaughter within the state, forcing the DeKalb plant to close. November 17, 2011: The 2012 agricultural appropriations bill is signed into law, without the passage from 2005 that defunded horse meat inspectors. Slaughterhouses made moves towards reopening, though none ever did. Janaury 2014: A new federal budget, this time including the language that outlawed funding for horse meat inspectors, is signed into law and horse slaughter in the US is effectively illegal. While slaughter in the United States has been rendered illegal, it’s still legal to ship horses over the borders to Canada and Mexico, among other nations, where horse slaughter facilities still operate. Most Americans are opposed to the concept of horse slaughter, viewing horses more as pets and less as livestock produced for human consumption. Horses are generally not consumed by the American public, though the meat is considered a delicacy in other countries around the world. It is the opinion of this author that outlawing the export of horses for slaughter only treats a symptom — not the root cause of the problem, which is an overabundance of horses without the commitment of connections to care for that horse for its entire life. Understanding that horses are not raised intending to be for human consumption, it should be the responsibility of everyone who cares for that horse throughout its life — its breeders, trainers, owners, and riders — to ensure that every horse meets a humane and compassionate end. The stigma around euthanizing a horse that can no longer be cared for needs to be ended, so that horses aren’t ever put in a situation in which slaughter is a viable end-of-life option. Weigh in, Horse Nation: what are your thoughts on the SAFE Act? Where do you think we need to make changes to solve the problem once and for all?